DURHAM, N.C., March 28, 2017 /PRNewswire/ -- Today the Target-to-Lead company Icagen announces a collaboration with Bayer to develop new X-ray fluorescence assays using the proprietary XRpro® platform. These assays are designed to help Bayer to progress various early discovery programs in the area of transporter targets. "Icagen looks forward to collaborating with Bayer on this ground-breaking project," said Dr. Doug Krafte, Icagen's CSO. "XRpro represents a unique application of X-ray fluorescence technology and has the potential to unlock new drug discovery efforts for previously untouched molecular targets." The XRpro® technology leverages the unique capabilities of X-ray fluorescence for high throughput analysis of plasma membrane ion channels and transporters, including non-electrogenic symporters and antiporters. XRpro® is a label-free technology that directly quantifies ion flux in cell populations without dyes, fluorophores, and radiolabels and offers the ability to conduct assays in complex buffers and media, including 100% serum. Biological elements with an atomic number of 16 (sulfur) or greater are measured simultaneously, including biologically important monovalent ions (e.g. K+), divalent ions (e.g. Ca2+), transition metals (e.g. Zn2+), halogens (e.g. Cl-), and tracer ions (e.g., Rb+, Sr2+). Icagen partners with global pharmaceutical and biotech companies to generate high-quality, advanced leads. As a focused, Target-to-Lead (T2L) company, Icagen works with collaborators in multi-year, integrated drug discovery programs as well as piecemeal projects to fill-in the gaps for R&D efforts. Born from a biotech background and matured by pharma companies, Icagen brings to partners a North American team with over 20 years of experience in early discovery. The process of drug discovery starts with druggable targets. Icagen scientists have vast experience in target-based drug discovery, including ion channels, kinases, GPCR's and transporters. 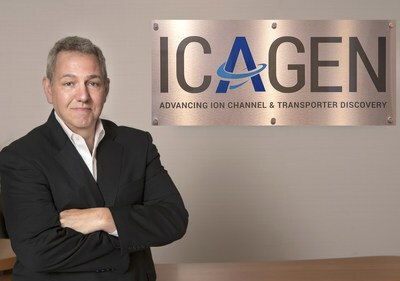 The Icagen team works with collaborators to determine target feasibility using state-of-the-art computational chemistry methods. Once a target is selected, the team combines virtual screening, ultra-high throughput screening (uHTS), biology and medicinal chemistry to generate viable leads in an iterative process. For more information email info@icagen.com.